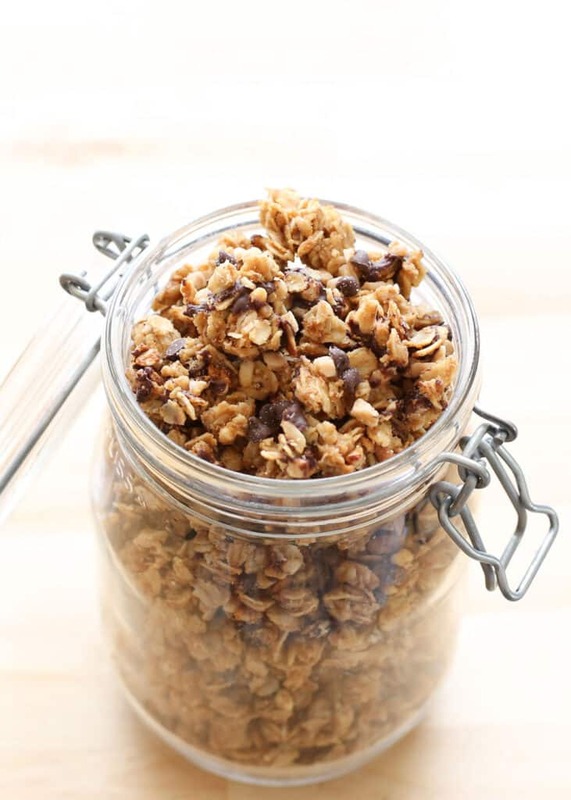 Peanut butter, chocolate chips, and toffee bits are all mixed up in this awesome granola. My kids enjoy granola so much; I couldn’t resist making a fun new dessert version for them when I saw the chocolate chips in the cupboard as I was starting the granola the other day. My kids loved this granola so much (big surprise, right?) that they begged for a sprinkling of it over their cereal and yogurt each day until it was gone. Over the past few months, granola has been on our table in one form or another at least once or twice a week. I make a batch every other week and I love having it in the cupboard for easy breakfasts. I especially love that I don’t have to pay close attention to the granola when using the slow cooker to make it! 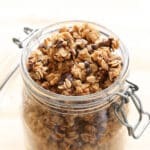 This is the easiest granola I have ever made. Check out the original recipes for Slow-Cooker Granola, and the Tropical Pineapple Coconut Granola as well. 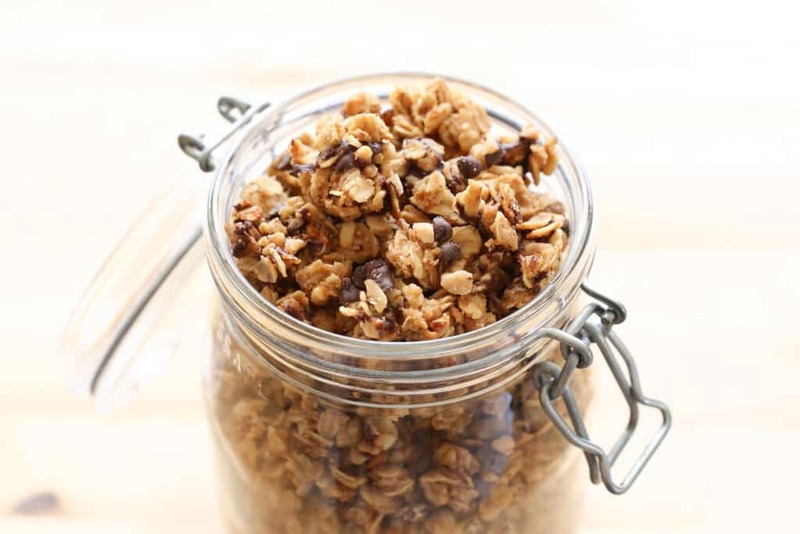 Try it once and I bet you’ll love making granola in the crock-pot every bit as much as we do! Kitchen Tip: I use this slow cooker to make this recipe. Pour the liquid over the oats in the crockpot and stir very well to thoroughly coat all the oats. Place the lid on the crockpot, leaving it slightly vented. Cook on HIGH for 20 minutes and then stir very well, being careful to scrape the sides and the bottom of the crock-pot. Cook an additional 15 minutes and stir again. Line a large baking sheet with parchment paper and set it next to the crockpot. Cook 15 minutes more and stir one more time. Spread the granola across the baking sheet and stir in half of the chocolate chips and toffee bits. Let cool for 20-30 minutes. Stir in the rest of the chocolate and toffee. Let cool completely and transfer to an airtight container. Enjoy! The granola cooking time varies depending on how hot your crock-pot gets. One of my crock-pots finishes the oatmeal in under an hour, while another one takes almost two hours. When you begin to smell the granola, it's probably time to stir it again. Use a spatula or large spoon to stir along the edges and the bottom of the crock-pot every 15-20 minutes. It is possible to burn the granola in the crock-pot. if you do not stir it frequently enough, or if you do not scrape the sides and bottom each time you stir it. The granola is done when the liquids have been absorbed and the oats look moist, but not wet. It will finish drying out and clump together a bit while it cools on the baking tray. I have never made granola and this looks like a good starting place. This looks too easy not to try. Yum! I never thought of doing this in a crockpot or adding all those goodies to it! Can I use creamy pb instead? Sure. You can use whichever nut butter you like best! Sure. I've made this with maple syrup as well! can you suggest a substitution for the wheat germ oil? I'm having a hard time finding toffee bits. What brand do you use?